Hello, my name is Andy McLaughlin and I’m a Graphic Artist, Illustrator, and Photographer. I have a small studio in the village where I live here in the UK, tcistudio.co.uk. I graduated from Blackpool and the Fylde College in 1993 studying Technical Illustration and have worked as a freelance Illustrator and Graphic Artist since. 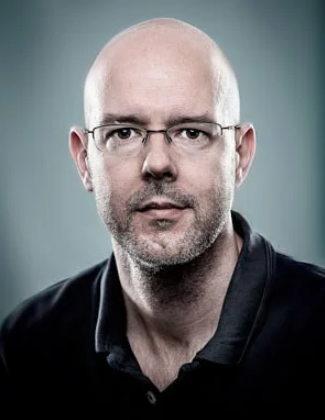 After a short spell working as a technical illustrator, I went freelance and have produced illustration and graphic artwork for many clients across a broad range of industries but usually with a slant to the technical and data-heavy subjects like computing and popular photography. I’ve worked extensively in National Press Graphics and magazine publishing, illustrating and designing. I use Illustrator, Photoshop, Form•Z (3d), InDesign and of course, photography in my work. 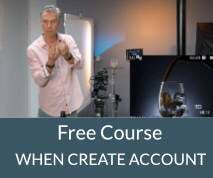 I discovered Alex’s work a couple of years ago, and wow, I was amazed and hooked. 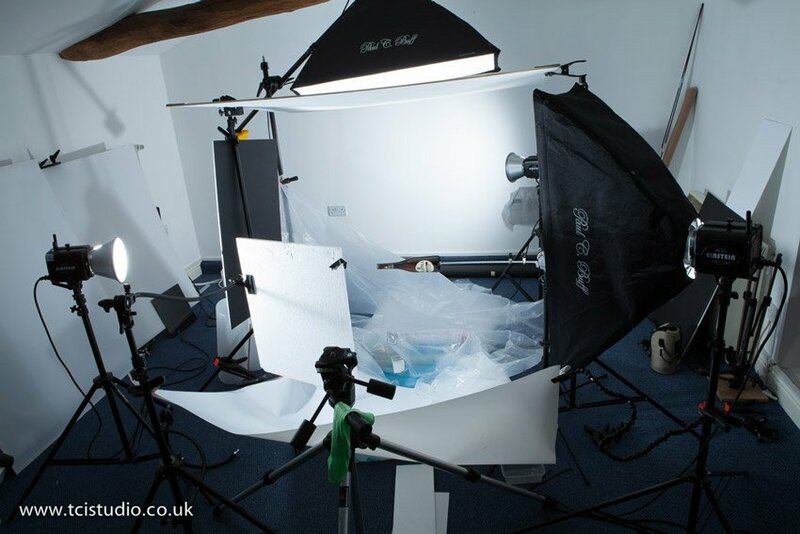 The detail in the frozen splash and the creative possibilities of combining great product photography and liquid, shots like the Godiva bottle shot inspired me and opened a whole new creative world! I work extensively with Photoshop with all of my Graphics work so the post-production is just as important to me, the more I learn in my photography the more benefit I see in the post-production, it’s a Ying and Yang thing! 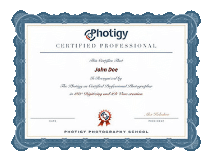 I also love using high-speed techniques, multiple exposures and HDR in my other photography and graphics work. Married with a daughter I live in a small village near Saffron Walden, Essex, UK, (very close to the City of Cambridge). I wanted to create a portfolio piece that combined product photography with a splash. 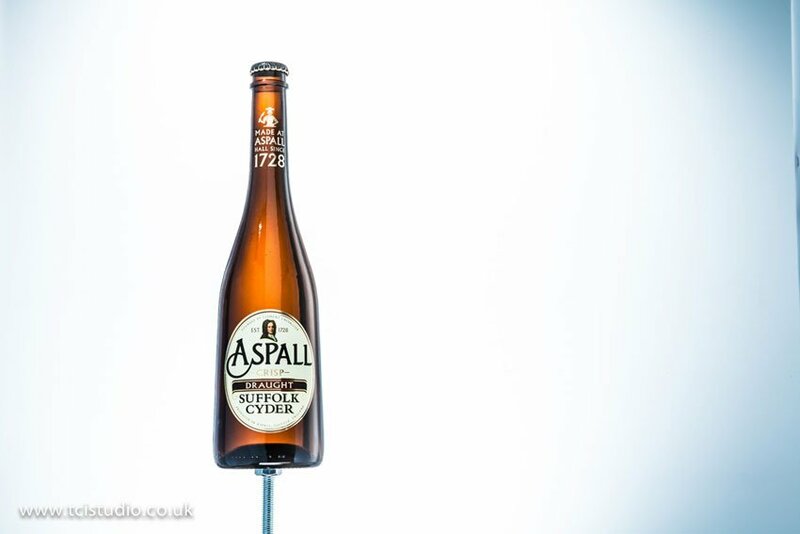 For a while, I’d been sketching and working out an idea using this rather handsome Aspall Cyder bottle. It’s a pleasing shape and I thought it would make a great subject for a composition. 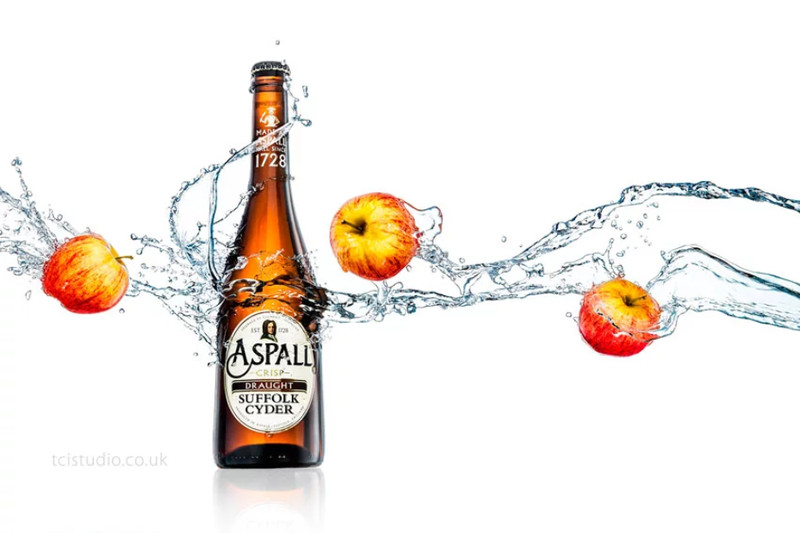 I also thought that there was an interesting visual story to make by mixing the product shot with the ingredients used in the cider i.e. water and apples. For the composition, I wanted the water horizontal across the image and not looking like I’d just poured water onto the bottle. I could have tried to throw the water horizontally but I decided that this would create very high velocity and too much turbulence, scattering the splash too much as it hit the bottle. I was hoping to capture silky folds and twists in the splashes as they wrap around the bottle, this way I could capture the distortion and refraction of the bottle in the main part of the splash and keep this area really detailed and interesting. I also would have to keep the label clear and clean, which would be harder if there was a lot more turbulence around. So, I decided that I would need to shoot the bottle horizontally. I could control the direction of the splashes more easily, capturing the splashes vertically should give me straighter splashes to would work with my horizontal composition when rotated through 90 degrees. 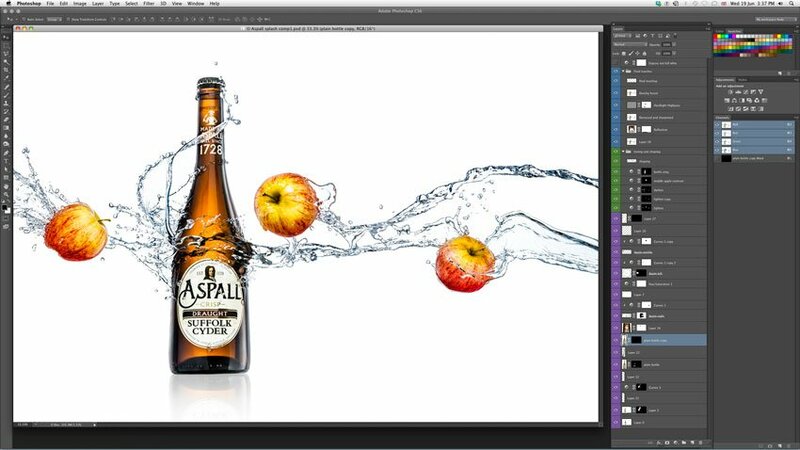 I would shoot a combination of a clean bottle image and splashes onto the bottle, then shoot the apples and splashes, and choose the best ones and composite the final images together in Photoshop. A) A ‘Clean’ bottle image with no splashes. B) Splashes have thrown onto the bottle from above and from below. 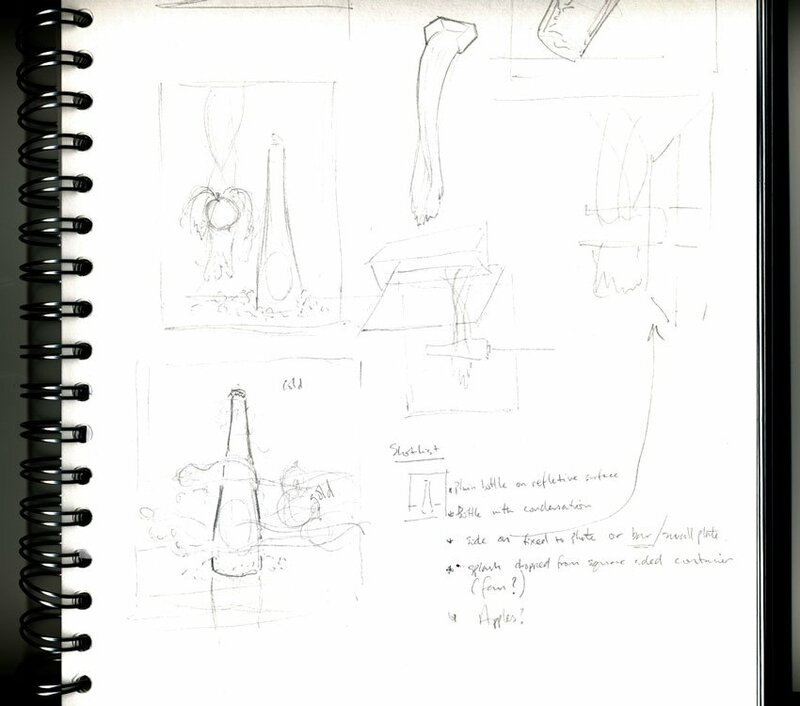 Capturing the interaction/reflection/refraction of bottle through the water. 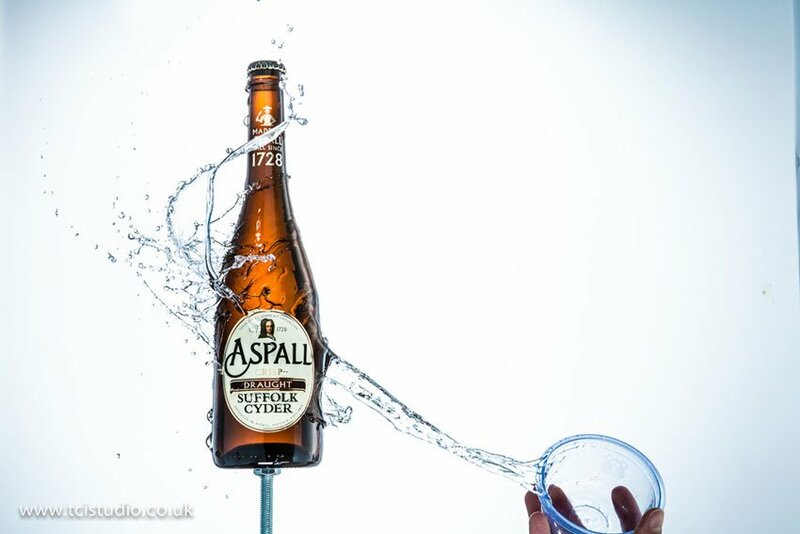 C) Apples suspended by a thin line, capture plenty of pours and splashes onto these. I poured and threw water from above and below for these as well. I would be using a lighting setup very similar to one of Alex’s bottle setups to create a nice highlight on the bottle and illuminate the label etc. My aim was to have a setup that I could use to light the bottle and the splashes without much modification so when everything is brought together in Photoshop, it would help the compositing and looking more cohesive in the final image. 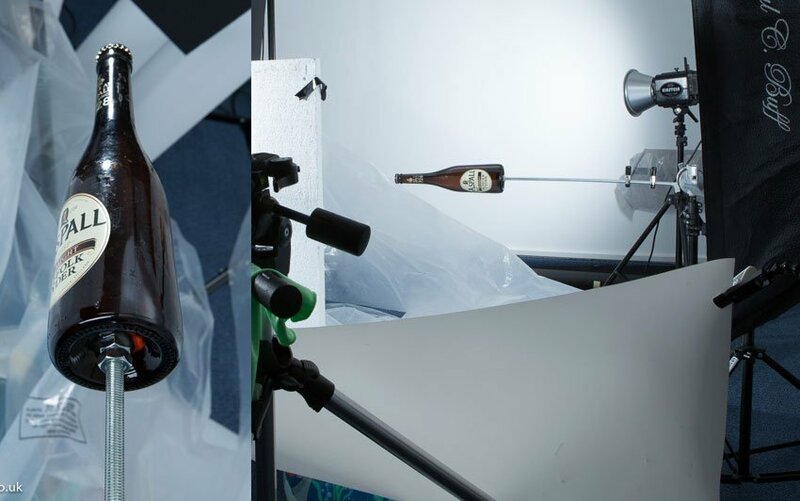 The main difference to Alex’s lighting setup would be that I am rotating the subject and the whole light setup through 90 degrees, because I won’t be able to stand the bottle on anything, I glued a nut to the bottom of the bottle allowing me to hold the bottle in place using a threaded bar as you can see in the image below. Once I had the bottle held securely I could work on creating the right lighting. To make the positioning easier I shoot tethered and using the Liveview display on my computer screen with the Canon software, it’s then fairly easy to see if I have this as I want it. The lights one by one… Firstly I set the background light (bouncing off the back wall of the studio) and did a few test shots to see how much illumination or glow I could get through the bottle with the light set initially to 1/4000 sec in action mode. It turns out not a huge amount as the glass of the bottle was quite dark, but it would be enough to catch the main area of splash on the bottle. I could always get a clean shot of the bottle using two lights on the background which would give me enough glow to the bottle, then composite that in Photoshop. Next, the light creating the long highlight down the right hand side of the bottle. For this I used a strobe with a strip box above and slightly behind the bottle, between the light and bottle I placed a large (1.5m x 1m) home made diffuser panel and angled the strip box toward the camera (the gradient is clearly visible on the second of the photos above). This would help create the falloff I needed to have a nice graduated edge to this highlight. It looks a little severe in the clean bottle image below but gives good contrast and definition along this side, the movement in the image is from right to left and I wanted to emphasize this edge to help with this direction as it’s a strong part of the composition. 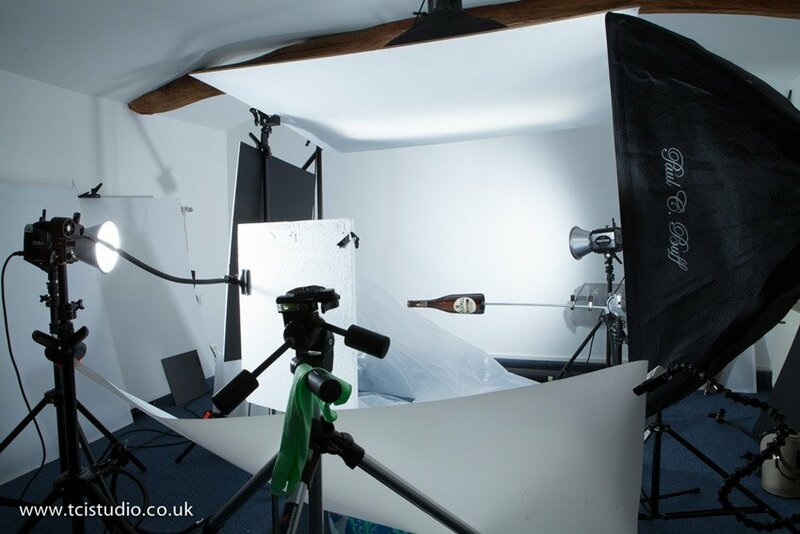 The strip box to the right of camera would be the fill light for the label, on Alex’s bottle setup this was the light low down in front of the camera used to fill the label and low enough so not to reflect in the body of the bottle. The highlight it creates on the bottom edge of the bottle would be removed later. The light to the left would act like a top highlight, create some sparks in the liquid part of the shoot, highlight the bottle cap, and add the top highlight on the apples. You can see I have added a styrofoam sheet (front left of camera) this reflects in the neck label on the bottle to highlight it as it would be black without this. I also have added a black card on top of the bottle to add contrast to the splashes when I start throwing them. Here is the ‘Clean’ bottle shot ready to start throwing splashes. I know it’s not perfect, the speculative highlight half way down the bottle and the hard white edge from the reflector panel, but these two elements are important for creating sparks in the splash and to illuminate the bottle neck decal. Of course I could composite shots together to achieve a ‘perfect’ shot but my objective was to get as close to a setup as possible to allow me to shoot the bottle and splashes together, this was very important as I wanted to capture the reflection and refraction of the bottle through the water, any imperfections could be sorted later in Photoshop. 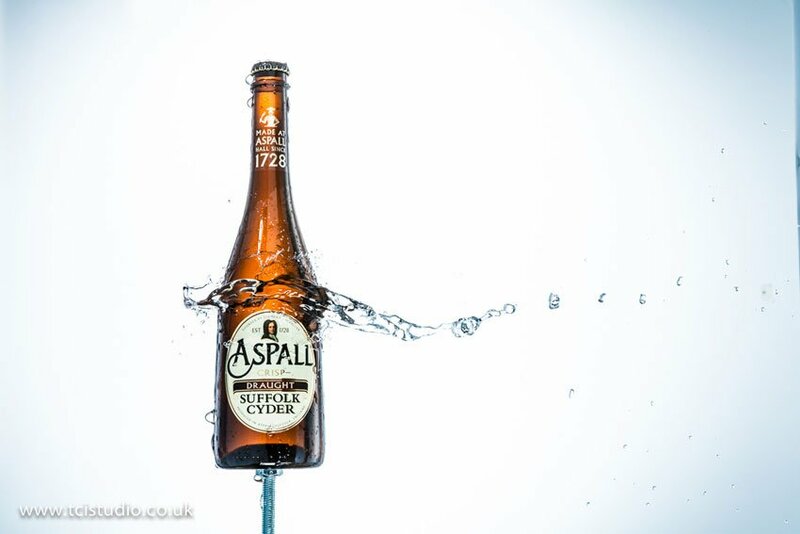 Here is exactly the type of shot I wanted, the main part of the splash is hitting the bottle and distorting around it, I love the interaction and distortion in the water. 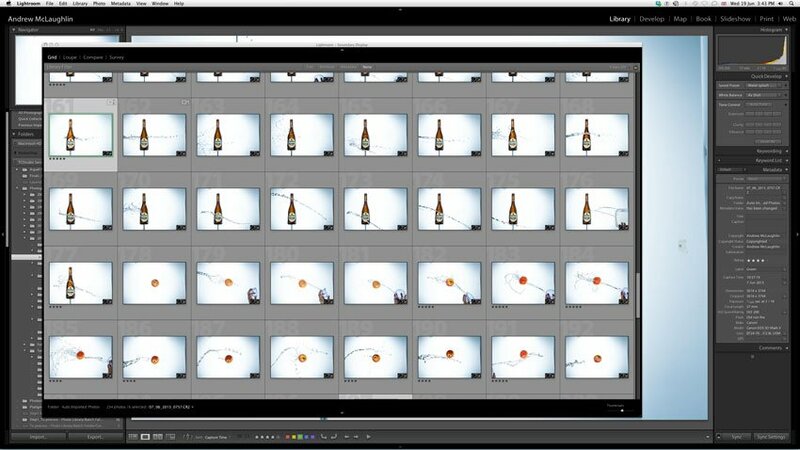 Some of the shots in Lightroom, in total I shot over 300 to get the selection I wanted. Three of the apple splashes selected to make up the composition. 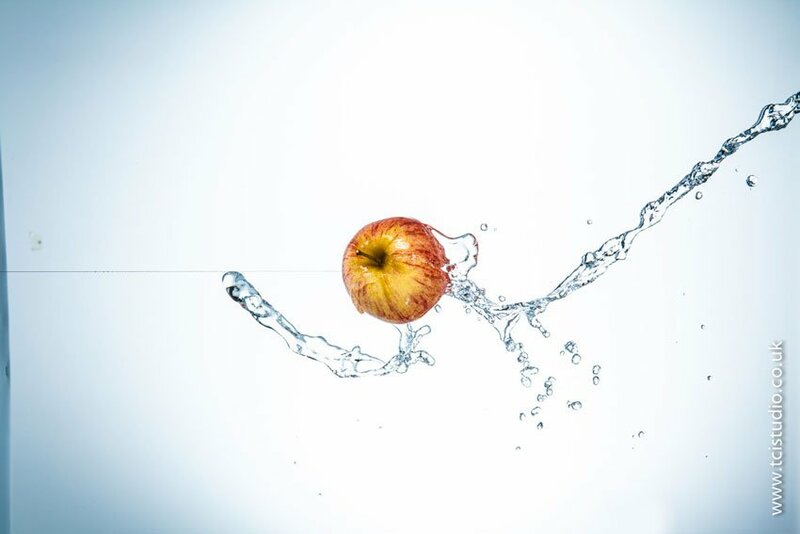 These images show the apples suspended on thin fishing line and I’m throwing water from above (image left and center) and from below (right). I used a small square sided container for the first image, this gave a flattering appearance to the splash, the other two I used a small round plastic cup with a smooth lip. This made more of a stream of water seen in the image on the right. 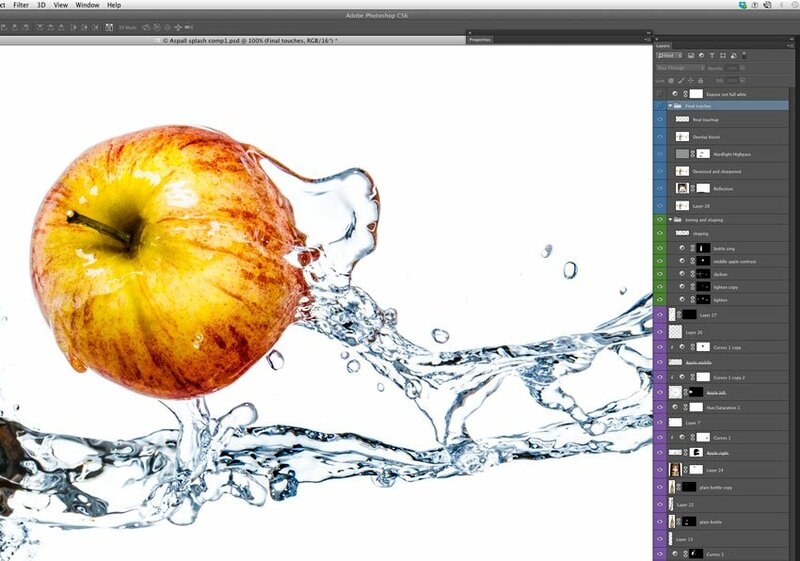 Here is the image I selected for the center of the composition rotated 90 degrees, I liked the way the apple looked like it was bursting through the splash, this would help emphasize the direction I wanted in the composition. 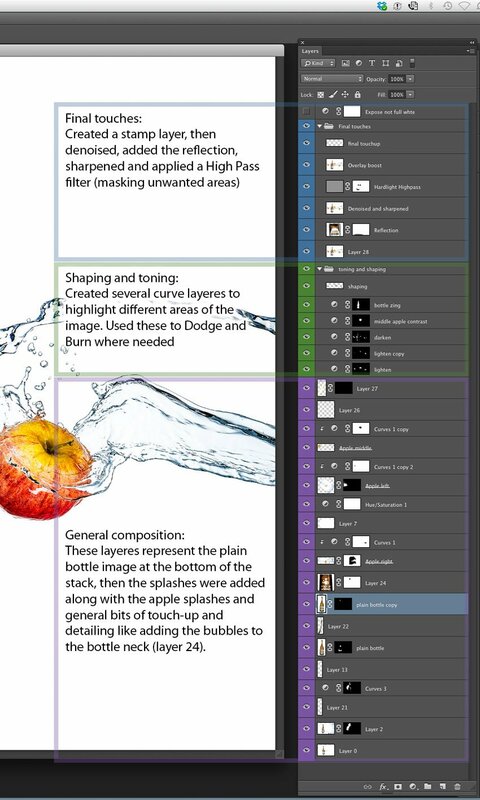 The Photoshop file consists of three general groups, 1. (purple) my compositional elements, 2 (green) my dodge and burning, contrast adjustments etc and 3. (blue) my final touches, de-noise, final touch ups, spot removal, sharpening and local contrast enhancement. One of my favorite bits in any Photoshop work is when I get to add contrast enhancement and sharpening, this is the last stage of the process for me, but I often have a play earlier in the process just to see what it will look like as well as identifying any areas of the image I need to be careful with. I hope you found it interesting and informative. I wanted to show my thought process and decision making as well as the lighting setup from concept to the final image, I hope I have achieved that.